A new possible planet around Barnard’s star has been discovered - a cold super-Earth with a minimum mass of 3.2 times that of Earth, orbiting near its snow line (the minimum distance from the star at which volatile compounds could condense). 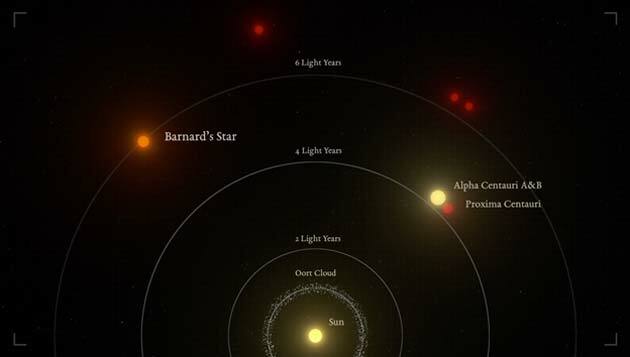 Apart from the Alpha Centauri system, which consists of three stars and is around 4.3 light years away from us, Barnard’s star is the next nearest star at 6 light years away. "After a very careful analysis, we are 99% confident that the planet is there," stated the team's lead scientist, Ignasi Ribas of the Institute of Space Studies of Catalonia and the Institute of Space Sciences, CSIC in Spain. "However, we'll continue to observe this fast-moving star to exclude possible, but improbable, natural variations of the stellar brightness which could masquerade as a planet." Barnard’s star has long been “the great white whale” of exoplanet hunting, said Carnegie astronomer, Paul Butler, the co-author on the Nature paper. The total velocity of Barnard's star, with respect to the sun, is about 500,000 km/h. Despite this blistering pace, it is still not the fastest-known star. What makes the star's motion noteworthy is the speed with which it appears to move across the night sky, as seen from the Earth (known as apparent motion). Barnard's star travels a distance equivalent to the moon's diameter across the sky every 180 years. While this may not seem like much, it is, by far, the fastest apparent motion of any star. 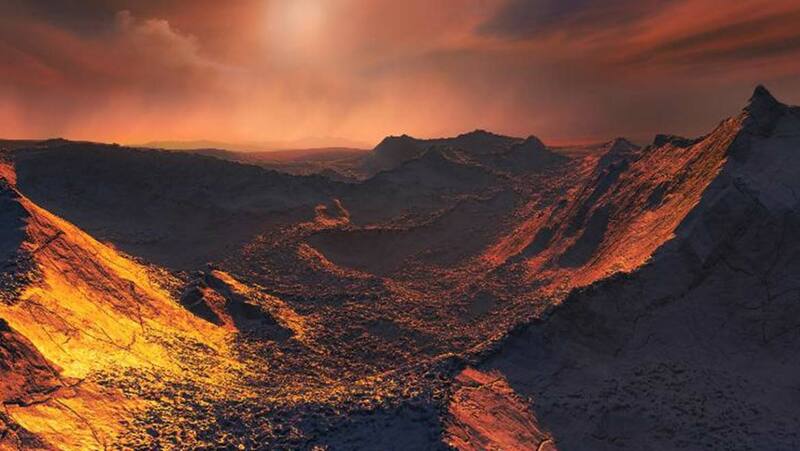 The planet - dubbed Barnard’s star b - is believed to lie around 0.4 astronomical units or 37 million miles from Barnard’s star, which is less than half of the distance between the Earth and its sun. This new planet orbits around the star and completes a rotation every 233 days. The facilities used in this research were: HARPS at the ESO 3.6-metre telescope, UVES at the ESO VLT, HARPS-N at the Telescopio Nazionale Galileo, HIRES at the Keck 10-metre telescope, PFS at the Carnegie's Magellan 6.5-m telescope, APF at the 2.4-m telescope at Lick Observatory, and CARMENES at the Calar Alto Observatory. Additionally, observations were made with the 90-cm telescope at the Sierra Nevada Observatory, the 40-cm robotic telescope at the SPACEOBS observatory, and the 80-cm Joan Oró Telescope of the Montsec Astronomical Observatory (OAdM). The evidence for the existence of the planet came from gravitational forces, which caused a shift in the light coming from the nearby star and heading towards the Earth. This was tricky to detect because the planet was reported to be very small as well as distant, so it required the analysis of more than 20 years’ worth of data. To elucidate its presence and nature, the scientists undertook an intensive monitoring campaign with the CARMENES spectrometer, collecting precise radial-velocity measurements on every possible night during 2016 and 2017. The team also obtained overlapping observations with the European Southern Observatory (ESO)'s HARPS and the HARPS-N instruments. The combined Doppler monitoring of Barnard’s star, including archival and newly acquired observations, resulted in 771 radial-velocity epochs (nightly averages), with typical individual precisions of 0.9–1.8m/s, obtained over a timespan of more than 20 years from seven different facilities, and yielded eight independent datasets. The parameter space was scanned using hierarchical procedures (signals are identified individually and added recursively to the model) and multi-signal search approaches (fitting two or more signals at a time). The long-term intensive monitoring of Barnard’s star and the precision of the measurements, which incorporated data from all precise, high-resolution spectrometers in operation, has pushed the limits of the radial-velocity technique into a new regime of parameter space, namely super-Earth-type planets in cool orbits. This also provides a bridge with the microlensing technique, which has traditionally been the only probe for small planets in orbits close to the snow line. "We have all worked very hard on this breakthrough," concluded Anglada-Escudé. "This discovery is the result of a large collaboration organized in the context of the Red Dots project that included contributions from teams all over the world. Follow-up observations are already underway at different observatories worldwide." "I think this discovery shows the power of the [radial velocity] technique for detecting longer period, small planets that are much harder or not possible to detect with missions like Kepler and TESS, which focus on finding transiting exoplanets in shorter orbital periods," Johanna Teske, the study co-author and Hubble Fellow at the Carnegie Institution for Science, wrote in an email. "This study sets a wonderful example of collaboration and coordination across multiple teams and multiple data sets, something that doesn't always happen successfully in exoplanet research. It is only by combining data and working collaboratively that this very challenging detection was possible." Flying Motorbikes Are Here... At Flying Car Prices!